65. The left-hand disk or wheel, C, is the driving-wheel, upon which is fixed the tappet, A. The other disk or wheel, D, has a series of equidistant studs projecting from its face. Every rotation of the tappet acting upon one of the studs in the wheel, D, causes the latter wheel to move the distance of one stud. In order that this may not be exceeded, a lever-like stop is arranged on a fixed center. This stop operates in a notch cut in wheel, C, and at the instant tappet, A, strikes a stud, said notch faces the lever. 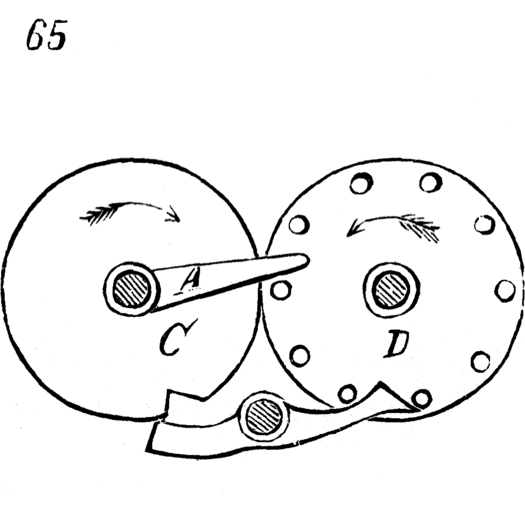 As wheel, D, rotates, the end between studs is thrust out, and the other extremity enters the notch; but immediately on the tappet leaving stud, the lever is again forced up in front of next stud, and is there held by periphery of C pressing on its other end.